* Includes US Plug. For EU plug, please add (-E). The myFuge™ 5 microcentrifuge includes a four position rotor for compatibility with a variety of 50ml test tubes, including 5ml snap cap centrifuge tubes. In addition, this combination rotor has four additional slots for centrifuging standard microtubes (1.5 / 2.0ml). 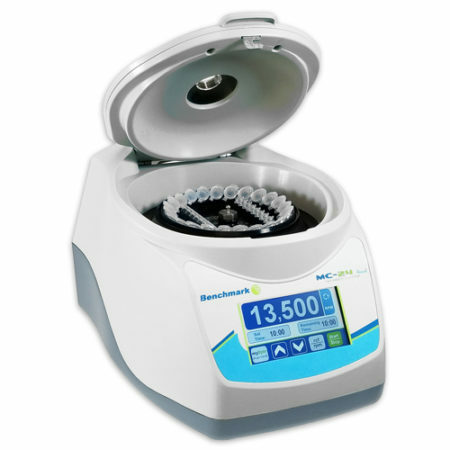 Simply close the lid and the centrifuge quickly accelerates to the fixed speed of 5,500 rpm. The 5ml rotor positions accept 5ml centrifuge tubes directly, while 5ml blood and culture tubes (12 x 75mm) are accepted with the included adapters. The microtube positions are designed to accept 0.5ml and 0.2ml tubes with the use of optional adapters.